October 21, 2013, Boston, Mass. - While U.S. hotel guests are curbing their appetite for hotel restaurants and room service, they appear to be expressing a desire for pampering and wellness. For the second consecutive year, hotel spa revenues and profits have increased at a pace greater than other non-rooms department sources of hotel revenue. According to the recently released 2013 edition of PKF Consulting USA, LLC's (PKFC) Trends® in the Hotel Spa Industry report, spa department revenue increased by 5.0 percent at the properties in the survey sample. For reference purposes, this compares favorably to the 2.3 percent increase in food and beverage revenue, the second largest source of revenue for most hotel. "Due to its historical stigma as a luxurious amenity, spa revenue initially lagged behind the growth of other revenue sources during the early stages of the recovery," said Andrea Foster, vice president and national director of spa and wellness consulting for PKFC. "However, the 2012 increase in spa revenue is a trend we anticipated would occur. There has been a notable focus shift to wellness, specifically taking better care of ourselves for improved health and quality of life, of which spas are an important part." Spas located in both urban hotels and resort properties enjoyed increases in revenue during 2012, though each achieved their growth in different ways. Urban hotels not only were able to induce more guests to avail themselves of spa services, but they were able to increase prices, as well. The net result was an attractive 7.2 percent gain in revenue. On the other hand, resort spa revenue grew by just 3.8 percent. "With occupancy levels at resorts rising by 2.4 percent, it can be assumed that resort spa managers struggled with the pricing of their services or were unable to up-sell additional treatments to the newly captured hotel guest demand," Foster surmised. Trends® in the Hotel Spa Industry is PKFC's annual survey of hotel-operated spa departments in the United States. A total of 125 hotels submitted data for 20 of the most important revenue and expense categories within their spa departments. The report allows hotel spa owners and operators to benchmark their revenue and expense ratios on a per-available-room, per-occupied-room, per-square-foot, and per-treatment-room basis. Not included in the survey sample were day spas, destination spas, or leased spa operations. Massage, skin care, and body work treatments continue to generate the most revenue at hotel spas. Combined, these services represented 72.6 percent of total spa revenue at the properties in the survey and grew by 4.7 percent in 2012. 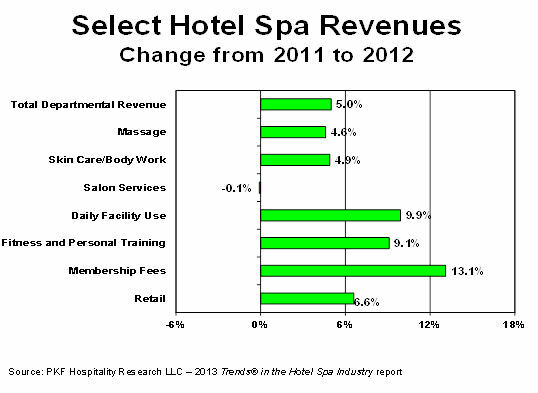 While the "core" spa services grew in 2012, salon service revenue declined by 0.1 percent during the year. "It is a challenge for hotel spas to compete with local hair and nail salons, from the standpoint of pricing relative to nails and salon/stylist loyalty relative to hair," said Foster. "Data from the 2013 spa Trends® report indicates that hotel spas continue to seek customers from the local community to supplement revenues from guests at the property. The combined revenue from facility use and membership fees, fitness and personal training, and health and wellness services increased by 4.6 percent in 2012. These are revenue sources most frequently associated with local patrons," noted Foster. Spa managers also were successful at increasing the purchase of spa merchandise and clothing. 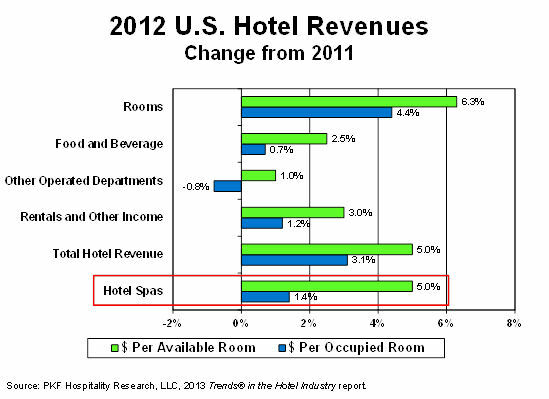 Retail revenue for hotel spas grew by 6.6 percent in 2012. "Growth in revenue is certainly welcome news, but the increase in business volume also carries with it an increase in expenses," said Foster. 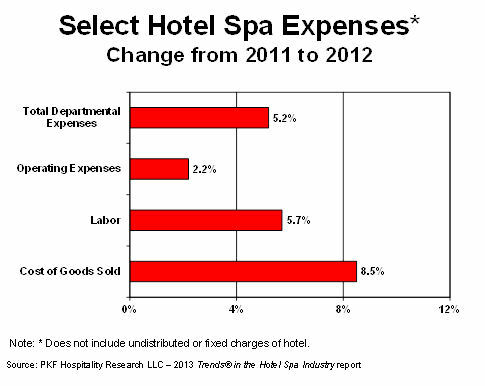 "While revenues were growing at 5.0 percent in 2012, total spa department expenses grew by 5.2 percent. Accordingly, spa department profit margins declined slightly from 21.6 percent in 2011 to 21.4 percent in 2012." Labor costs are the single greatest expense within hotel spa departments. The combined costs of salaries, wages, bonuses, and payroll-related expenses (benefits) equaled 58.6 percent of total department revenue in 2012, or 74.5 percent of total departmental expense. Because of the high levels of personal service required at spas, labor costs increased by a relatively strong 5.7 percent from 2011 to 2012. Similar to all department heads within hotels, spa managers are concerned about the less controllable benefits component of labor costs. During 2012, payroll-related expenses increased by 8.2 percent, while salaries, wages, and benefits grew by 4.9 percent. This is why travel industry trade associations are monitoring legislation regarding mandated employee-related taxes and benefits. "Fortunately for hotel spa operators, many spa technicians work as independent contractors and therefore are not necessarily eligible to receive a full package of benefits. Payroll-related expenses within hotel spas averaged 22.8 percent of total labor costs in 2012 compared to an average of 29.6 percent for all hotel employees," noted Foster. 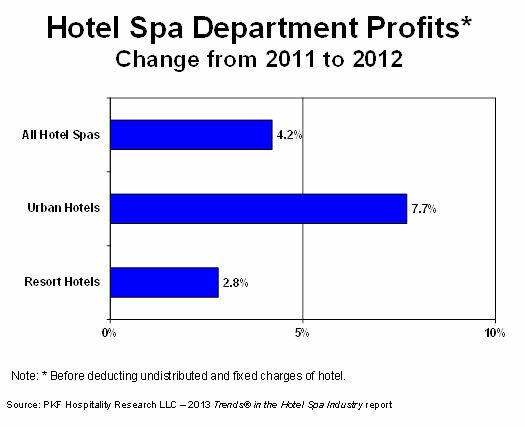 Despite the decline in department profit margins, hotel spas were able to achieve growth in departmental income. In aggregate, spa department profits for the spa Trends® sample increased by 4.2 percent in 2012. Achieving greater revenue growth, urban hotel spas also were able to enjoy more growth on the bottom-line compared to resort hotel spas. The impact of spas on the overall performance of a hotel is difficult to measure. Research in the area has found that hotels with spas often achieve higher average daily rates and that spas do induce some degree of lodging demand. However, it is difficult to determine whether these positive performance observations are causal or coincidental. "Though difficult to quantify the full economic effect of spas, we expect their impact to expand in the coming years," said Foster. "With a shifting focus to healthier lifestyles, born of both growing awareness and of necessity with our population's poor health and resulting increases healthcare costs, we expect to see more demand for spa- and wellness-related services and experiences, both within the spa itself and beyond the spa walls in other areas of the hotel." Inspired by the spa, some hotels' wellness-oriented guest rooms are being equipped with special lighting, wake-up and nighttime light therapy, vitamin-infused showers, air purification and water-filtration systems, and wellness-focused television channels to provide a fully-rested and recharged stay. Food and beverage menus include healthier selections, and fitness centers are being upgraded to inspire guests to stay active while away from home. "Many of these new additions are not part of the spa department itself. Therefore, the resulting revenue generated will not be reflected as spa-related on the hotel's income statement. However, spas set the foundation for these experiences, and as guests try out and enjoy these wellness-oriented offerings, hotels should able to convert them to spa guests," concluded Foster. To purchase a copy of the 2013 Trends® in the Hotel Spa Industry report, please visit www.pkfc.com/store. Headquartered in San Francisco, PKF Consulting USA, LLC (www.pkfc.com) is an advisory and real estate firm specializing in the hospitality industry. PKF Consulting USA is owned by FirstService Corporation (FSRV) and is a subsidiary of Colliers International. The firm operates two companies: PKF Consulting USA, LLC. and PKF Hospitality Research, LLC. The firm has offices in New York, Boston, Indianapolis, Chicago, Philadelphia, Washington DC, Atlanta, Jacksonville, Tampa, Orlando, Houston, Dallas, Los Angeles, Bozeman, and San Francisco.